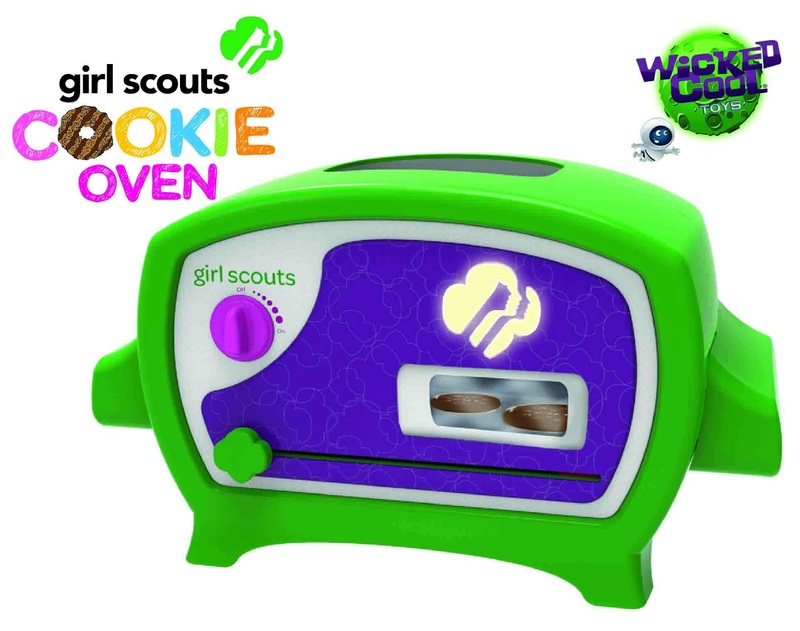 The Girl Scouts Cookie Oven features mixes inspired by some of the most popular Girl Scout Cookies®, such as Thin Mints® and Trefoils®, and, along with the Girl Scouts On-the-Go Wagon and Cookie Stand will give girls a chance to express their creativity, learn new skills and experience the fun of Girl Scouts all year long. Girl Scouts Cookie Oven – The Girl Scouts Cookie Oven lets aspiring bakers experience the hands-on fun of making their own Girl Scout Cookies. A real working oven, it comes complete with tools and mixes that allow girls to make cookies that look and taste just like the real thing. With equal parts fun, creativity, and learning, it is a recipe for excitement as little bakers learn how to mix and measure ingredients, and then watch their cookies bake though a viewing window as a warming station heats and melts delicious cookie coatings and frosting! 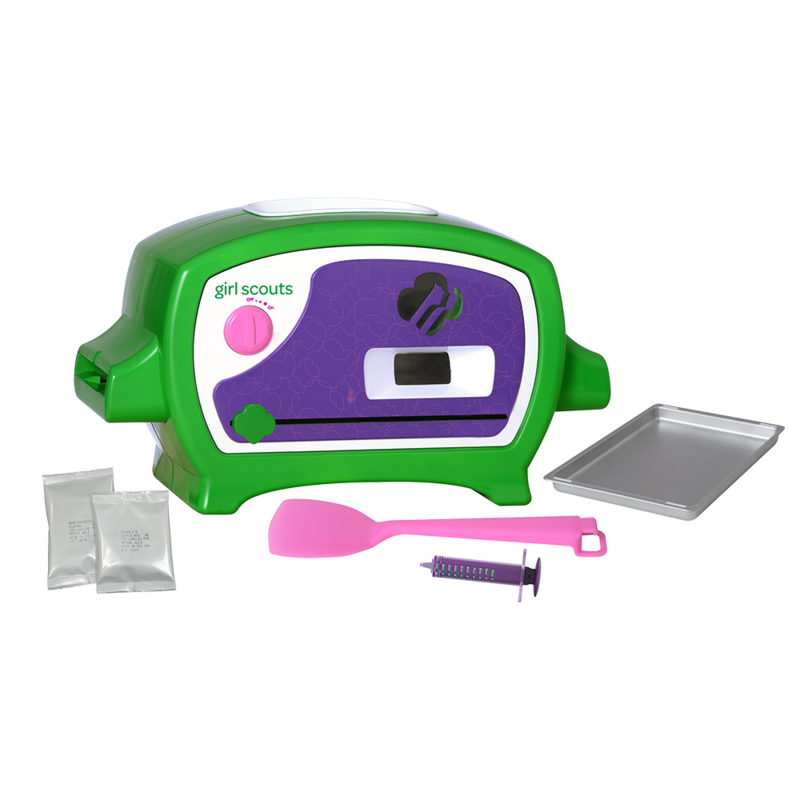 The Girl Scouts Cookie Oven comes with a mix to create six Thin Mints®, a spatula, baking pan and measuring tool. SRP is $59.99. The Girl Scouts® Cookie Oven brings the fun and excitement of Girl Scout Cookie™ season to playtime! It is a great way to introduce baking to your child! It takes around 30 minutes to make a small batch of cookies. The plus is the oven comes with everything you need to make a single batch of Thin Mints. I was surprised how good the cookies tasted once baked! It's a fun time for the whole family and teaches kids the basics of baking. I would encourage adult supervision as it is an oven. Popular Girl Scout Cookie flavors as well as classic cookie favorites give young bakers the opportunity to make cookies everyone will love, and include Thin Mints®, PB Sandwich, Trefoils®, Chocolate Peanut Butter, Coconut Caramel, Chocolate Chip, Sugar and Oatmeal. SRP is $6.99.